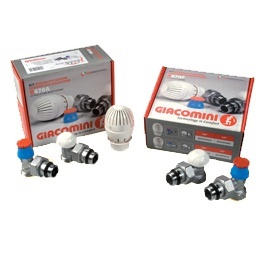 Indirect Energy Metering | Giacomini S.p.A. The GE700 electronic heat cost allocator produces a reliable estimate of the energy transferred from the radiator to the environment. The detected data are transmitted via radio frequency - in a manner that's reliable and harmless to health - to the measurement devices located outside the apartment. The wide range of accessories means they can assembled on all the most common radiators on the market. Complete range of electronic wireless M-BUS devices for managing the energy consumption data obtained by the heat cost allocators. Radio frequency transmission allows the consumption data to be obtained outside the apartment in a safe, reliable, continuous manner that respects the inhabitants' privacy. Indirect metering works together with the individual thermoregulation performed by the thermostatic valves installed on the radiators. The thermostatic heads (that can be adjusted to suit the user) ensure the precise control of the temperature in each room in a simple, reliable way, guaranteeing optimum comfort and notable energy savings. Image of the heat cost allocator GE700 electronic radio heat cost allocator: manufactured in compliance with Standard UNI EN 834, with 2-sensor technology for detecting the radiator temperature and the room temperature. Anti-tampering seal and disassembly alarm. 6-figure display for direct reading, optic interface for programming/reading, long-life lithium battery (standard 10 years). 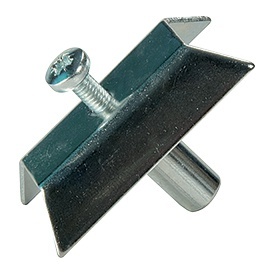 Image of brackets Complete range of fixing elements for every type of radiator. Image of the heat cost allocator with remote sensor Heat cost allocator with remote sensor, to be used in those situations where the heating element is difficult to reach or where there isn't enough space to fit the allocator on the radiator. 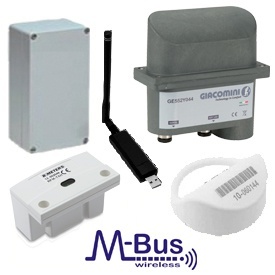 Image of antennas and concentrator The heat cost allocators and data management devices can transmit the data in wireless M-BUS mode at 868 MHz (European band ISM - Industrial, Scientific, Medical). The consumption data can be read in two ways: centralised (remote) or "Walk-by", via a mobile terminal supplied to the appropriate personnel. Image of the GPS The installation and programming of the heat cost allocators with all the radiator parameters can be handled by the Giacomini Professional Service network (GPS).